It's about that time- hunting season is upon us. Or it may have started already depending on what state you're in. Either way, you're probably restocking all of your hunting gear to better prepare for some innawoods fun this year. After many requests, we have decided to release a special edition holster for hunting season. 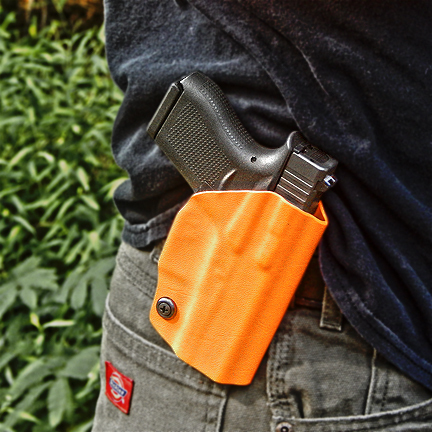 The Custom Orange OWB Hunting Holster comes equipped with an Adjustable Military Grade Rubber Retention System that can be tightened to your preferred holding using a Philips head screwdriver. 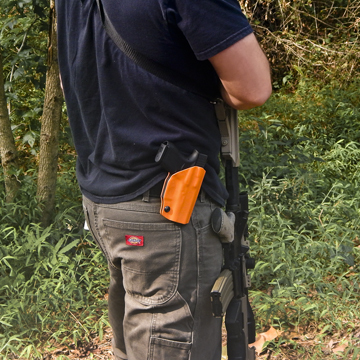 Made from rugged .093" Orange Kydex material, coupled with our secure Double Loop Belt Attachment, this outside the waistband holster can hold its own against any swamp, brush or woods you tread through. This item is seasonal and will not be offered after Fall/Winter 2015/16. Order your own Custom Hunting Holster now!